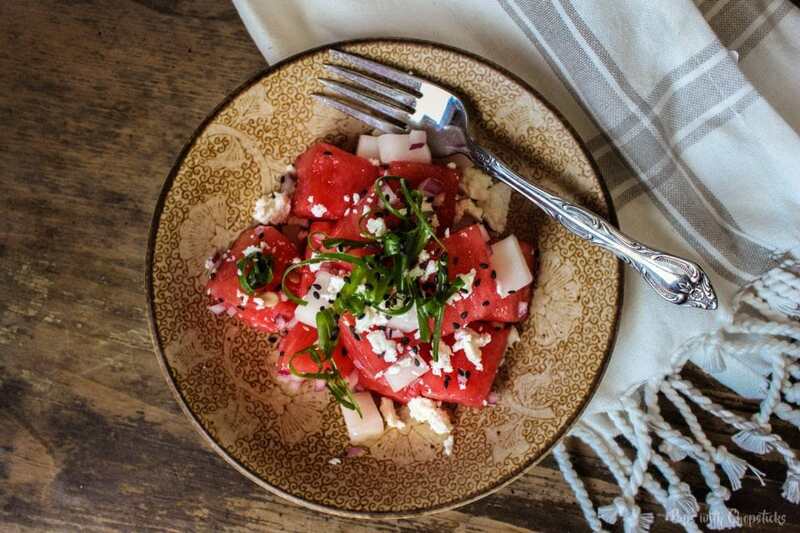 Sweet, refreshing watermelon feta salad with a bit of a tang from the pickled daikon radishes and ends off with a salty note from the feta cheese. Great as a salad or as a side dish! Sound like an odd combination? You’ll be surprised! Who loves watermelon?? I do, I do! 🙂 There are moments I love it so much that I feel like eating it for dinner! Probably not too practical, but that’s okay! 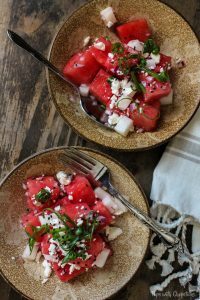 This watermelon feta salad is juicy and sweet with a bit of a tang from the pickled daikon radishes and ends off with a salty note from the feta cheese. You know what’s weird? I’m actually not a fan of salty watermelon. My dad used to sprinkle salt on his watermelon all the time and told me it brought out the sweetness of the watermelon but I never understood it and never liked it! Go figure. 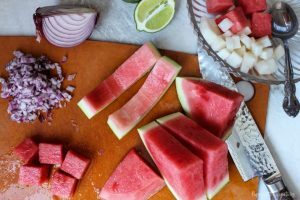 This watermelon feta salad didn’t have the same feel, the tang from the pickles and lime pulls the salty and sweet flavours together into something that almost reminds you of a thai salad. All ingredients for this watermelon feta salad can be found at your local grocery store. Surprisingly I have also even found daikon radishes available at a local grocery stores as well! However if you cannot find it there, you will most likely find it at an Asian grocery store. Randomness with Pickles: I have never tried this (but plan to in the near future) but substituting a sweet crunchy pickle – like the bread and butter pickles for the picked daikon! If you get a chance to experiment with the pickle let me know how it goes! Always love seeing and hearing about fun and new creations. For a more subtle onion flavour, you can substitute the red onion for shallots. Soaking them in cold water also takes the bite out of raw onions. If you’re following along, you’ll remember that last week, I put out a really quick and easy pickled daikon radish recipe which is what I used for this recipe. How Do You Pick Out a Good Watermelon? Lift it Up – It should feel heavy for its size, pick up a few and compare which one is heavier and go with that. Heavy means juicy. Shape & Colour – A symemtrical even shaped watermelon with no bruises is always a good thing. Look for a nice dark green watermelon. Look for a yellow patch on the bottom side as well – the yellower the better. A whiter bottom means it was picked while it was still ripening while a yellow bottom means it sat under the sun in the same position for longer. Bopping it – This method is a bit of a hit or miss but I generally just slap it and it makes a deep ‘thunk’ hollow sound with a bounce back to my hand then I’m happy. Is it summer yet? I think it is. 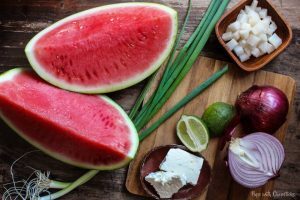 Sweet, refreshing watermelon feta salad with a bit of a tang from the pickled daikon radishes and ends off with a salty note from the feta cheese. Enjoy as a salad, appetizer, side dish or snack! to remove the bite of raw onions, after you finished chopping them, soak them in cold water for 1 minute and then drain and rinse them out. this salad is best enjoyed when it has freshly been prepared. This dish is easy to make. Like watermelon is easy to buy in summer. Other ingredients we usually have at home in our daily cooking. This looks so elegant and delicious! It’s going to be perfect this summer when watermelon is in season. I never put salt on it, but since moving to california, I’ve discovered putting tajin on fruits like watermelon and mango – it’s essentially lime chili salt and it really brings out the sweet! Haha – I like salt and watermelon. But I like salt and anything. Salted caramel was a revolution for me:-) I really like this idea. I’d never, ever even though about trying to do something with watermelon except eat it. Great thinking. I’m impressed! 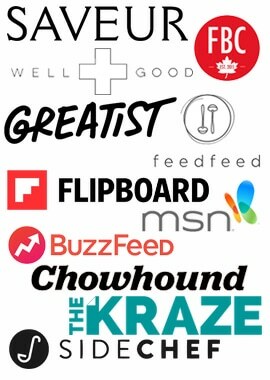 Thanks for another great idea. 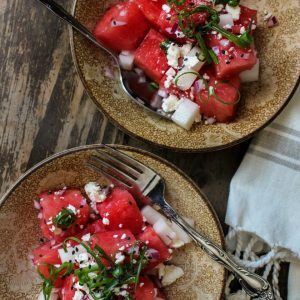 This looks so good, watermelon and feta sounds like a tasty combination! Definitely want to try this! Beautiful colors for such a refreshing salad! I love watermeal and love the sounds of this salad, especially with the feta! If there’s a salad that screams summertime, it’s a watermelon feta salad! Sounds delicious! That sounds so different for a summer salad! I’m going to give this a try! i put salt on my watermelon when it’s kind of blah and isn’t very sweet. feta sounds like a much more fun way to insert some seasoning though, and i’m always game for anything with pickled daikon (: if i ever muster up enough motivation to do something with watermelon on an “i want to eat watermelon as a meal” day, then this would be perfect! I still don’t know why I can’t do salt and watermelon but I’m okay with feta. Must be the cheese. haha! Gotta love the cheese!